Try myofascial release for effective pain relief! Scroll down for group stretching information! 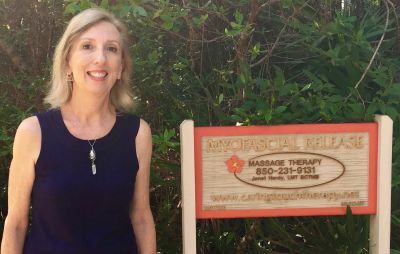 Janet Hardy, Expert Myofascial Release Therapist, Board Certified, FL Licensed Massage Therapist tailors individual therapy sessions to relieve pain and stress while increasing range of motion and improving your posture. Myofascial release creates a healthy environment in the tissue, promoting optimal function of organs down to the cellular level. The authentic healing of John F. Barnes' Myofascial Release therapy is the best pain relief therapy that I have encountered in my 24 years of massage therapy and the many modalities I've studied. I have noticed more effective and longer lasting results with this work than when I just did massage therapy, including neuromuscular massage. *Do you feel tightness or discomfort when you bend over to pick something up? Do you experience any stiffness when you get up in the morning? *Would you like to get back to the activities you need to do or enjoy doing? I specialize in Myofascial Release (MFR), which addresses your fascial web of connective tissue. You may find this to be one of the most effective techniques you've experienced for pain, tightness and stress relielf EVER! Let me stretch you and work out your kinks! I invite you to read the information on MFR by clicking on 'Benefits of MFR' and also use the link on that page to explore the J.F. Barnes' Myofascial Release website with lots of information available to you. Come stretch with me and experience awareness of what it feels like to self treat painful or restricting areas for freer movement. Suggested donation: $10. per class or 10 class punch card for $80. If you are a JFB therapist and have taken MFR I, you are welcome to attend the NW FL Study Group meetings. Please email me to be put on the email list.